A local ranger for the Environment Agency of Iceland attempts to make a call from the unofficially named "Telephone Mountain" in Vesteinn Runarsson, Iceland. The passenger boat arrives at the bottom of Veidileysufjordur, a short inlet with a long name, to drop off backpackers for a multi-day trek. A weather-beaten group that's completed the trip waits to board, eager to get back to a part of Iceland where they can reconnect with the world via Wi-Fi. By boat, that will take about a half-hour. 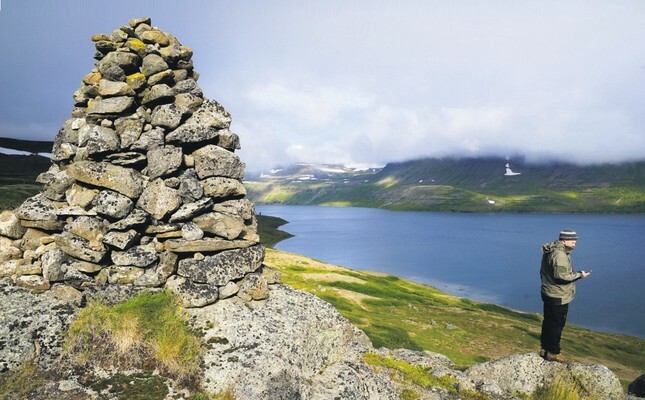 No roads lead to the Nordic country's northernmost peninsula, a rugged glacial horn that reaches for the Arctic Circle. Making a phone call requires walking up a mountain for a cell signal so weak, clouds seem capable of blocking it. But internet service soon could be reaching the Hornstrandir Nature Reserve, one of the last digital-free frontiers in what might be the world's most-wired nation. The possibility has most hikers, park rangers and summer residents worried that email, news and social media will destroy a way of life that depends on the absence of all three. "We see a growing appreciation for the lack of online connection," Environment Agency of Iceland ranger Vesteinn Runarsson, who patrols the peninsula's southern end on his own. "Looking to the future, we want to keep Hornstrandir special in that way." The area has long resisted cell towers, but commercial initiatives could take the decision out of Icelanders' hands and push Hornstrandir across the digital divide. Companies such as Elon Musk's SpaceX are racing to deliver high-speed internet service to every inch of the world by putting thousands of small satellites into low Earth orbit. Their success would have global implications, bringing the benefits and downsides of internet communication to places that are off the grid because of poverty or war, or where internet access is reserved for the wealthy. That's also true for sparsely populated communities and far-flung destinations in Canada, Russia, Alaska and elsewhere in the vast Arctic region, where broadband service generally is prohibitively expensive. Yet in Iceland, the prospect of constant connectivity has called up an old debate on whether Hornstrandir's wilderness should stay unwired. Despite or because of its remoteness, Iceland ranks first on a U.N. index comparing nations by information technology use, with roughly 98 percent of the population using the internet. Among adults, 93 percent report having Facebook accounts and two-thirds are Snapchat users, according to pollster MMR. Many people who live in northwestern Iceland or visit as outdoor enthusiasts want Hornstrandir's 570 square kilometers (220 square miles), which accounts for 0.6 percent of Iceland's land mass, to be declared a "digital-free zone." The idea hasn't coalesced into a petition or formal campaign, so what it would require or prohibit hasn't been fleshed out. The last full-time resident of the rugged area moved away in 1952 -it never was an easy place to farm -but many descendants have turned family farmsteads into summer getaways. Alexander Gudmundsson, who vacations in the home where his great-grandmother grew up, doesn't have to look far down the family tree to see the effect of digital devices: his teenage daughter refused to come to Hornstrandir this summer because it would mean not having online access. "But once the kids are here, all they do is play outside," Gudmundsson said. Northwest Iceland's representative in parliament is less sentimental about the value of isolation. Since her election last year, Halla Signy Kristjansdottir has urged the Ministry of Transport to fund cell towers for the safety of sailors and travelers whose mobile devices currently are useless in and near Hornstrandir. The Environment Agency of Iceland estimates that 3,000 people trek through Hornstrandir every summer, moving from one fjord to the next. The travelers interviewed by AP there unanimously favored making the reserve a digital-free zone, though their notions of what that meant varied.